Singapore, 2013-May: Wallenius Wilhelmsen Shipping chose the Nonox Model 1100 to accompany the installation of the world’s largest ship borne scrubber. 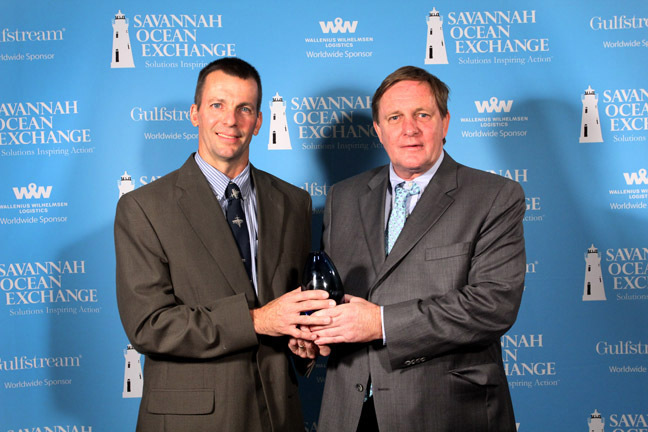 Click here for photographs and information..
Oslo/Savannah, 2012-September: The Savannah Ocean Exchange (SOE) Global Review Panel has selected the winners of the 2012 Solutions Exchange awards. The $100,000 Orcelle Grant was awarded to Nonox Emulsion Combustion System. Advancing a shipping and logistics solution for increased sustainability through zero-emissions, transport on land and at sea, the Wallenius Wilhelmsen Logistics Orcelle® Grant of $100,000 has been awarded to Nonox: Emulsion Combustion Systems submitted by Wes Pence and Eric Cottell. Fossil fuel emissions contribute to global warming and are the root cause of many health problems. These emissions can be reduced by improving the combustion process on the inlet side of the engine/boiler through the use of water-in-oil emulsified fuel. The Nonox emulsion combustion unit (ECU) is a complete emulsion fuel system containing the mixing chamber and fuel/water proportioning controls. The ECU produces an on-the-spot, water-in-oil emulsion fuel that reduces NOx, black carbon/soot and other air pollutants, without the use of surfactants or other additives. The system can be switched back and forth between emulsion and straight fuel at the flick of a switch. The Nonox Emulsion Fuel System is easy to install with little or no down time for the customer. The return on the investment is typically less than a year, and on larger installations less than that. This system is most attractive in today’s market due to ever increasing fuel costs and more stringent emissions regulations. Christopher Connor, Deputy CEO and CCO of Wallenius Wilhelmsen Logistics, congratulates the winners: "The Nonox Emulsion Combustion System is an innovative solution that can decrease emissions of harmful substances to the air considerably, both at sea and on land. The team has done an impressive job in developing this promising technology. We hope that the Orcelle Grant will make it possible for them to bring this product to market, and look forward to supporting the laureate on this journey." These LEAP TO ZERO+ Solutions all reduce the use of natural resources or waste generation as they increase productivity or economic well-being. Founded in 2010, Savannah Ocean Exchange unites international organizations across multiple disciplines and boundaries to distribute and adopt solutions that positively impact the Ocean, economies and health. The 2012 Board of Governors includes 31 thought leaders from around the world who represent diverse backgrounds and expertise; share a commitment to innovation and to the protection of our ocean, and the enhancement and advancement of solutions that will create new industries, expand job opportunities and recharge economies. Wallenius Wilhelmsen Logistics (www.2wglobal.com) delivers innovative and sustainable global shipping and logistics solutions for manufacturers of cars, trucks, heavy equipment and specialized cargo. WWL has approximately 4,400 employees worldwide and deploys around 60 modern vessels. The company has a strong environmental focus and is an industry leader in developing innovative solutions to reduce its operational impacts on the environment.